At the present moment Sagem MY-X6 is the top model in the model line, the phone personifies practically all technologies which the user can wish. The list of characteristics looks enough impressively, moreover, this is practically full analogue of such model, as Sony Ericsson T610, so expected in the market. The engineers have enclosed all the set of functions realized anyhow in phones of other manufacturers in this model, let's try appreciating, what is the phone in work. At the first acquaintance with phone you pay attention to its sizes (110x46x22 mm), if to look at the face side directly there is no impression that the device is thick. But it is necessary to take the phone in hands and its thickness is felt. The weight also cannot be named small, it is 106 grammes. The explanation it is necessary to search not in the materials applied in the construction of the case (by no means metal), but that in the phone have applied the lithium-ionic batttery of increased capacity (1050 mAh) to supplying with the greatest operating time. According to the manufacturer the phone is capable to work about 310 hours in standby mode and up to 4 hours and 40 minutes in talk mode. In conditions of Moscow MTS network the device has worked 4 day at 40 minutes of talking, use of other functions - about 2 hours (games, organizer, messages and other). 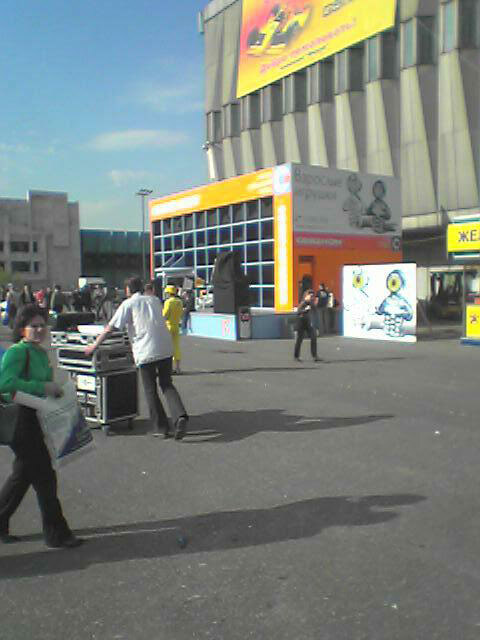 The result is quite good, especially taking into consideration the presence of big color screen. It occupies almost the half of the case, its resolution is 128х160 points (35х43 mm physically), that allows displaying up to 12 lines of text. 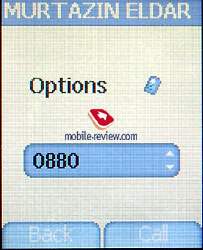 It is curious, that during text viewing (or its inputting), you can change on smaller font size, it is enough to press #. The screen is fulfilled by TFT technology, it does not become blind completely on the sun, the information is read on it, though hardly. 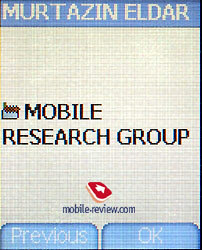 As a whole on this parameter phone surpasses Sony Ericsson T610, but concedes to models from Samsung. 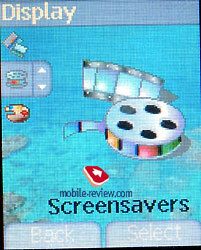 The screen supports displaying up to 65000 colors, paints are alive enough, but without illumination the screen is not read. So, in standby mode you can see screensaver with clock and level of battery charge, but the font is so microscopic, and the screen is so dark that to discern the information is unreal. When the backlight is switched on, the screen comes to life. Developers have provided some operating modes of backlight, when works screen backlight and keyboard backlight, and when the screen is highlighted only. Clearly, that frequently we need only the screen backlight mode and it is a little, but saves up energy. 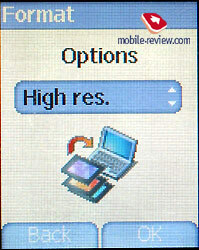 Such screen options, as brightness, contrast are not stipulated in the device. 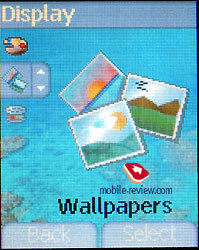 Everything that you can make is to choose one of the several preinstalled images as wall-paper or screensaver, to adjust menu's color scale. 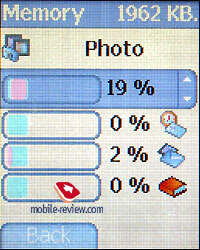 In phone's memory are placed very interesting photos, this actually allows not using additional pictures from PC, at its absence. Under the screen locates 4-item navigating joystick, near to it two software keys and already under them the standard send call and release call keys. The first disappointment overtakes you when start working with navigating key, it is too sunk in the case. Are comfortable only downwards pressing, all other directions cause big difficulties. Numerical keyboard black is also unsuccessful - keys are small on the size, close located, besides strongly sunk in the case. 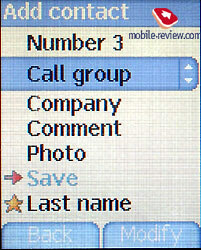 When dialing number or especially messages there is discomfort, the keyboard does not stand up to criticism. So such big problems are explained by insignificant surface, on which it was necessary to place the group of keys. The symbols put on keys are badly visible, the font is too thin. Keyboard backlight is of white color. The phone has some color themes, in all cases the case's fringing is silvery, changes only the facial part's color. It is possible to get additional covers as accessory, they coincide with standard colors (Midnight Blue, Satin Red, Pearl White, Shadow Silver). The back panel has small backlash, the phone can squeak in hands (even without special pressing). 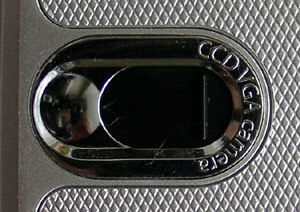 On the right lateral surface there is IR-port gap, there are no any keys for volume adjustment and other managing elements. At the bottom end face there is interface socket. 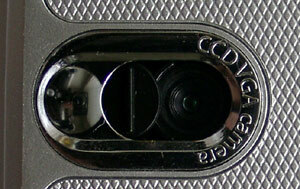 The back phone's surface presents the first surprise, here is placed the objective of camera cover with shutter. To the left of it there is a small mirror, it helps making photos. When you hold the phone in hands, you frequently involuntarily cover the objective with fingers. In the bottom of the panel locates the latch which fixes the back panel. Having shifted the latch, it is necessary to pull the panel to you, it is necessary to put the certain effort, otherwise the panel won't be taken off. The back panel is corrugated, this is a design decision for this device. Before passing to the story about menu organization, here are some words about process of switching on/off the phone. 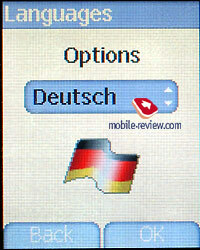 To switch on the phone you need to press on send call key, and the switching of is appointed to release key. As against the majority of devices these functions are not incorporated in one key, in some measure it is logical, but unusual during first time. 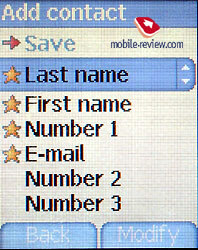 It is possible to choose various functions for software - keys in the menu, i.e. they are amenable to adjustment, it is doubtless advantage. 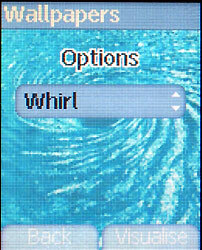 So, to get in the main menu it is possible, having directed the navigating key to vertical. 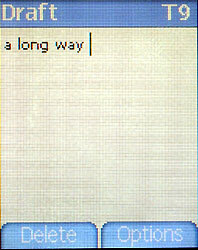 In the main menu there is a line of vertical icons, on the right is displayed the chosen item. 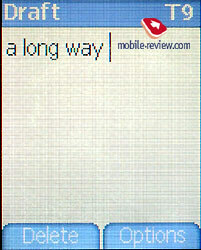 There is no fast navigation by shortcut numbers, it is necessary to scroll all menus manually. At low keyboard comfortableness, this is an obvious minus. 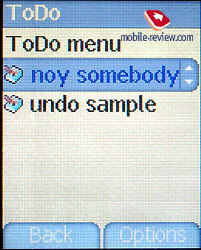 The majority of submenus are organized not by habitual lists, but just also as the main menu. 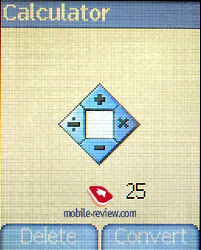 It is the extremely convenient, besides, the phone's interface pleases with variety, the abundance of graphics does not make various submenus similar among themselves. As a whole such menu is not bored, it is significant plus for the company. We'll take up separate functions of phone. In the device have applied dynamic memory allocation, it means, that 2.3 Mb of memory available to the user are shared between all applications. You do not have restriction by quantity of records in phonebook or by quantity of dictophone records, only the total amount of memory plays role of stopper. 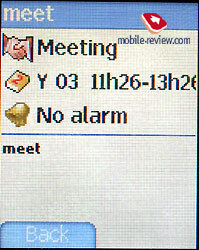 When pressing send call from standby mode is displayed the list of all calls, there can be up to 50 records in it. 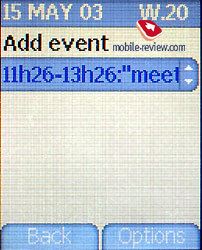 For the highlighted entry are displayed call type, talk time and date in the top line. Phonebook. 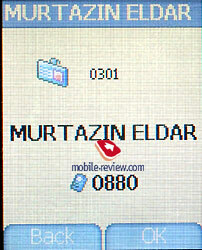 In phone's memory for one name it is possible to enter Name, Surname, name of the company, up to three phone numbers (to everyone there corresponds its type, you choose them from the list), e-mail address and comment. Also for a name it is possible to choose users group (them are 6, plus an opportunity not to bring the user in group). 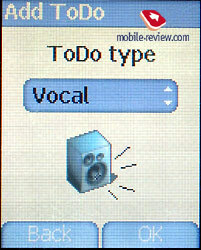 For each group it is possible to edit the name, to choose ring tone melody, icon, even call type, i.e. mode of its work. 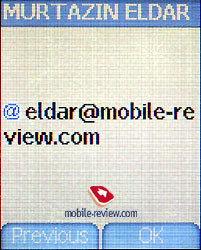 At last to the name in phonebook you can add an image, it can be both a picture, and a photo received by the built-in camera. 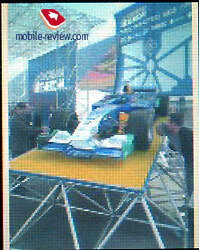 It is good, that the photo can be made even during filling in the phonebook. To defect it is necessary to attribute the necessity of preservation of each separate field at input, it complicates information input. On the other hand visiting cards, received from other phones by IR-port, are perfectly read and are correctly broken on categories. 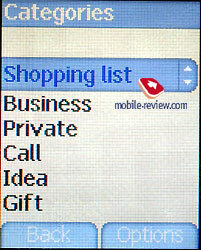 In the list of phones are displayed surnames of subscribers, or their names, there is fast search by the first letter. Viewing of separate record is organized not in best way so, you call submenu, choose viewing in it and already, then scroll through some screens with information. 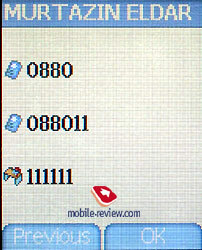 On all pages (the first or the second) where are phone numbers , it is enough to press call send key to call the dialogue window in which to you will suggest choosing number. It also delays the process of necessary number search though creates impression of functional richness. The convenience of work with phonebook can be estimated as average. Messages. 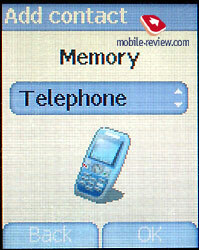 In phone's memory you can create templates, their quantity which is necessary for you. 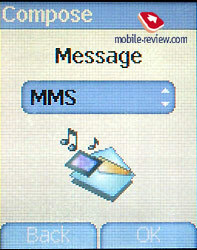 Besides usual SMS-messages, and also standard EMS, in phone is stipulated MMS support. The function has been checked up in several networks at once and has showed it quite efficient. 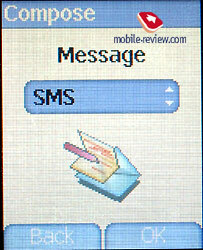 The opportunity to create the MMS-messages containing some pages (slides), concerns to pluses, similar realization can be met in devices from Sony Ericsson. 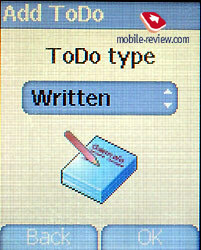 For fast text input it is possible to use T9 dictionary. Camera. The call of this item switches the phone in photo mode at once. 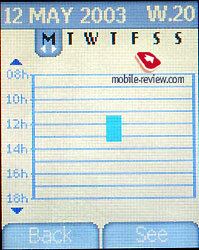 The phone's screen represents itself as view-finder, at sharp movements the picture is smeared, it has not time to be updated. In the phone are stipulated three modes of shooting - usual, portrait, and also in conditions of weak light exposure or in rooms. 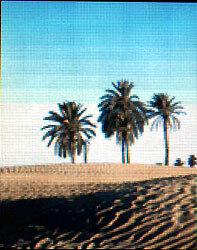 The format of received images is JPEG, the resolution is 640х480 pixels. The average size of picture makes about 50-60 KB. 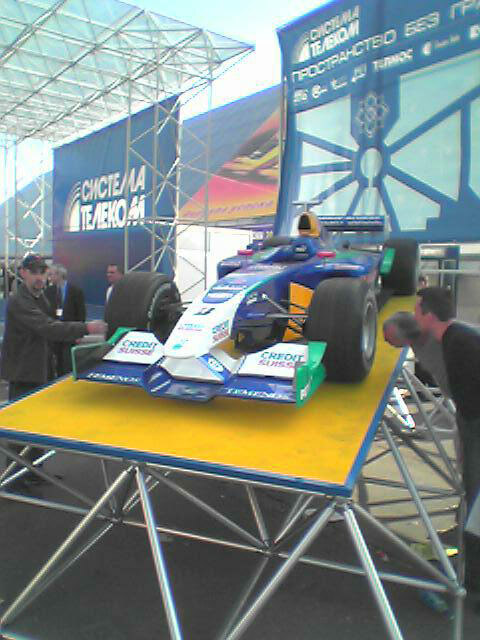 The second format of pictures is also stipulated, it is less (about 10 KB, 120х160 pixels). 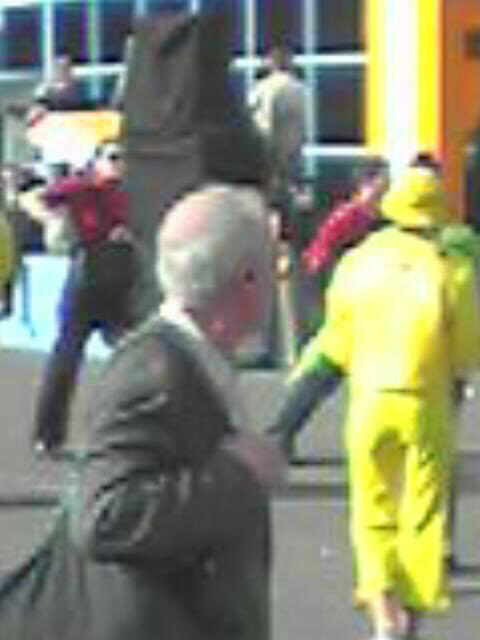 The navigating key movement upwards works as digital zoom, in my opinion, this function is unnecessary, as in the built-in editor there is an opportunity of increasing separate image's areas, to do this is possible on PC. 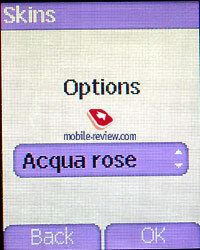 At application of digital zoom the quality of initial photo worsens, it is not necessary to use this function, if only as the small field-glass. Adjustments of the camera locate in the separate menu (Settings), here you can adjust the timer and also specify whether it's necessary to request you, in what resolution to save received photos or to do it automatically. Multimedia. In this menu there are folders with all your photos, pictures, sounds. Unfortunately, the navigation between photos is complicated, there is no preliminary viewing as small sketches, only the names of files. 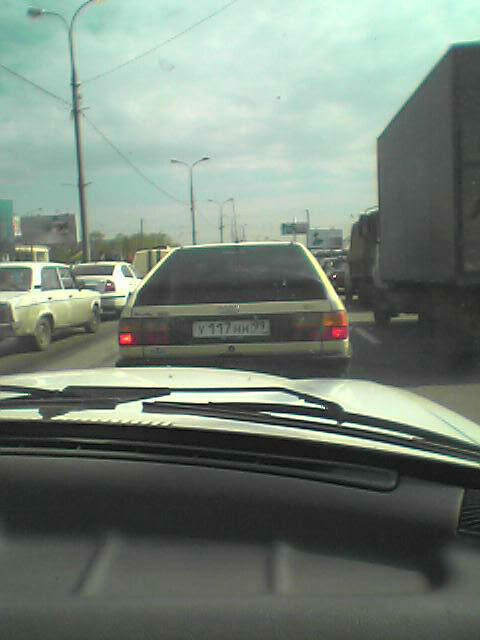 It is necessary to scroll over photos one by one, the same at choice of photo for name in phonebook, it is inconvenient. The chosen photo can be edited in the editor, the set of effects is extremely rich, here is increase of picture's area, change of brightness, contrast, transformation of picture into negative or grey scale, degradation, etc., etc. 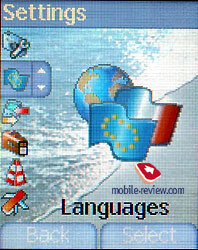 By the opportunities the editor comes nearer to simple computer graphic editors, it is not typical for phone. 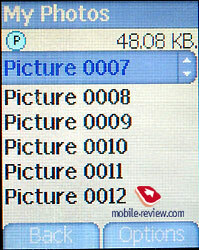 It is possible to adjust the chosen picture or photo literally in one movement as the screensaver or wall-paper. All received through WAP or IR-port melodies and pictures are located in the corresponding folders right now. WAP. 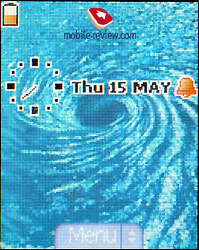 In phone is installed wap-browser of version 1.2.1, as a whole there is no anything unusual. Games. 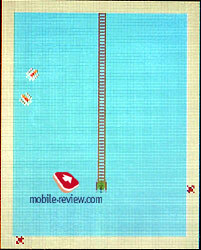 There are two games in phone, Picture Puzzle in which it is necessary to collect the picture from small parts, moving them, and also MegaBox Conquest. In the second game you eat off slices of game field and aspire not to get under the flying washers, similar games have many manufacturers. The device supports In-Fusio game platform, so at presence of this function support at the operator, you can load new games. 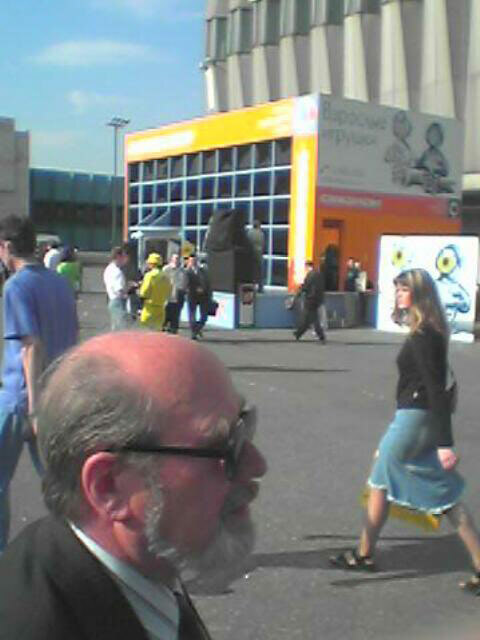 In Russia there is no such service by the moment, I doubt whether someone puts it into operation in the near future. In short the set of the built-in games remains the same, it is a pity. Organizer. 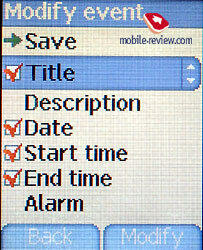 It is possible enter various events in the organizer, to adjust alert type for them, to adjust date and time. 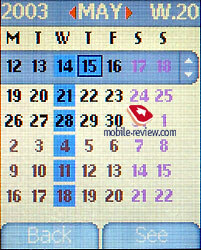 The viewing of calendar is possible, both for a month, and for a week with time grid, and for one day. There is a separate to do list, here you can allocate all your business by preinstalled categories, it happens conveniently. 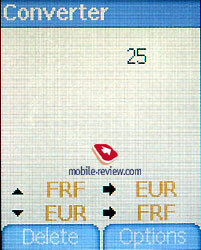 The calculator is usual; the currency converter is also standard. Both draw attention by graphic appearance. The alarm clock is unitary, it is adjustable for certain time, there are no repetitions. The countdown timer can be adjusted on the certain quantity of minutes, sometimes it happens useful. Settings. 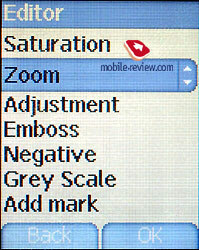 In this menu there are plenty of options related to phone, right here are adjustments of the camera, the screen, besides, adjustments of ring tones and alert types. In this phone it is possible to adjust not simply mixed alert type (vibration and melody simultaneously), but to specify, that first works only the vibration alert and then the melody. There is 5 different tones for camera for choice, accompanying shooting process. It is possible to choose any melody from standard set for accompaniment of events from organizer and other phone's functions, so flexible approach pleases. 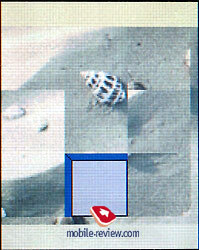 The standard kit includes the software for loading pictures, melodies on phone from PC (by cable, IR-port). Adjustments are not difficult, all works. 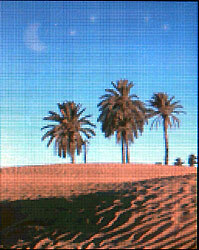 Some melodies and screensavers can be found at this site http://www.planetsagem.com/. Here you will be met by extremely pleasant French melody, the resource is made with taste. The sound quality in speaker is enough, the voice sounds vividly, the interlocutor is well audible, however, as well as you. There were no problems in work of the device, it’s reliable enough. 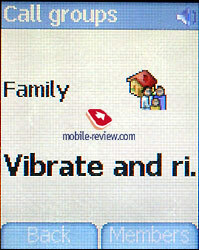 The vibration alert is average by force, affects the massiveness of the case, but it is felt. Polyphonic melodies sound rather loudly, the ring is audible. To the advantages of this model it is necessary to attribute the fact, that practically all technologies necessary for the user are collected in it, there is no only, perhaps, Java and bluetooth. The interface of the device is convenient, but in some moments is not thought over up to the end, too complicated. The built-in camera is one of the best for devices of such class by quality of pictures. To obvious shortcomings of this phone concern its big size, backlash of construction (scratch). The keyboard crosses out all pluses of the device, it makes the work with phone the occupation not for nervous, to dial the number, and especially, SMS, MMS-message is the extremely difficult. It is supposed, that sales of this model in the Russian market will begin at the beginning of summer, the price is not determined yet. Making start from the European price level, it is possible to assume, that it will be about 250 dollars. In our opinion, the model will draw attention, but becomes extremely popular by the end of the year when it will start to be selling for much smaller money (less than 200 dollars). As practice shows, such models are popular only during that moment when disappear from the market and the price for them is minimal.